Record appearance holder Louis Carey has been released by Bristol City, along with Liam Fontaine, Marvin Elliott and Stephen Pearson. Carey, 37, broke the achievement of John Atyeo by playing his 646th game for City on 29 December and it was to be his final appearance for the club. Jamaica international Elliott, 29, and fellow midfielder Pearson, 31, both struggled with injury this season. Fontaine, 28, has been out of favour and played only seven games this term. Youngsters Mitch Brundle and Kevin Krans also leave the club, while goalkeeper Elliott Parish has been made available for transfer. Louis Carey, Liam Fontaine, Marvin Elliott and Stephen Pearson have a combined appearance tally of 1,270 and 36 seasons of service between them. Parish, who has made 26 appearances for the club, signed from Cardiff last summer and still has a year left to run on his current deal. Fellow keeper Dave Richards, who also arrived from Cardiff, has agreed a contract extension until the summer of 2015, while Joe Bryan, Bobby Reid and Wes Burns have all been offered new deals. Speaking about Carey's exit - 19 seasons after he made his debut - manager Steve Cotterill said: "With Louis, we've had a good chat and it's tough to be the one to end his Bristol City career. "I'm delighted he got the all-time appearance record. That was always going to happen - I couldn't let it go. For his tremendous years of service, he fully deserves that accolade and I can't see it ever being broken." 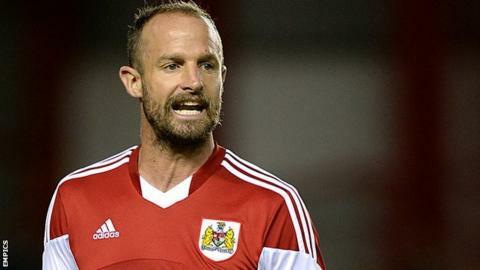 Six players ended the League One campaign on loan at Ashton Gate - Simon Moore, Nyron Nosworthy, Wade Elliott, Simon Gillett, Tyrone Barnett and Martin Paterson. Cotterill added: "All of them have now gone back to their parent clubs to see where they lie and any news on them, individually or collectively, we'll speak about in due course."